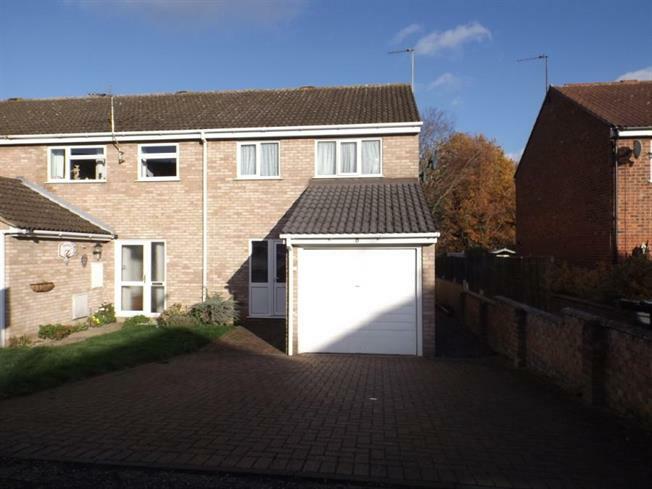 3 Bedroom End of Terrace House For Sale in Colchester for Guide Price £250,000. Just over 2 miles to Colchester Town Centre, 0.7 miles to Monkwick Infant School and Nursery, and 0.8 miles to Thomas Lord Audley School. Close to local pharmacy and shops and Middlewick Ranges. Situated in a cul-de-sac location this extended three bedroom house is offered for sale in good decorative order and benefits from a garage and off road parking. Guide price 250,000 - 260,000. Selection of wall and base mounted units with a roll top work surface and a sink and drainer, space for a washing machine, fridge freezer and a range oven. Double glazed window to the rear aspect. Decked area with the remainder being laid to lawn, fence enclosed boundaries with side access. There is parking to the front for two cars and a full length garage with an up and over door.